We have never had to wait for the arrival of Jesus as did the people who lived during the days of his arrival in a stable in Bethlehem. We know Jesus’ life story from even before his birth to after his resurrection. 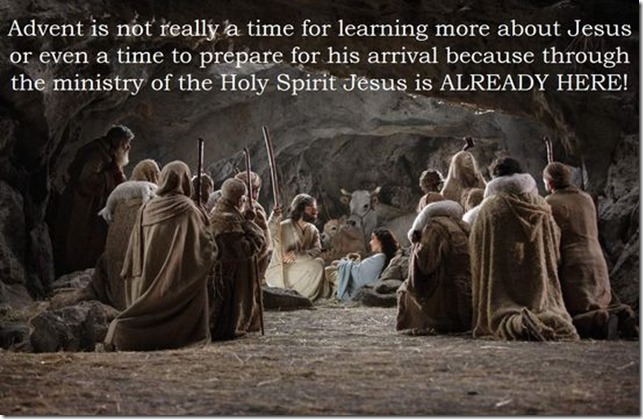 Advent is not really a time for learning more about Jesus or even a time to prepare for his arrival because through the ministry of the Holy Spirit Jesus is ALREADY HERE! Advent is a 40 day worship experience, a worship experience where our intimacy with Jesus himself becomes REAL not just his life story. The Psalmist wrote about the Advent worship experience hundreds of years before Jesus’ birth.